Now, who wouldn't love waking up to this toasting your bagel or waffle? 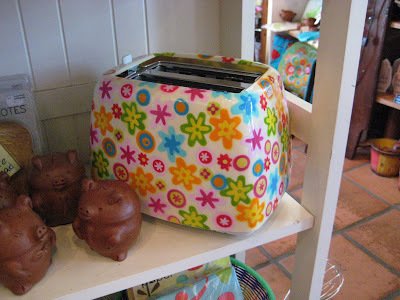 I spied this at a little downtown Stuart shop called April Daze. Isn't it adorable? I'd say this is perfect for a college dorm room or apartment! I wish it was perfect for my kitchen, but I think the colors would clash just a little. Thankfully, I have my Lilly travel mug to brighten my morning instead! Absolutely the cutest darn thing I have ever seen! Cute! You went shopping downtown!! That is too cute. Perfect for a dorm room/suite.